President Obama faces an uphill battle in making the case for U.S. military action in Syria. By a 48% to 29% margin, more Americans oppose than support conducting military airstrikes against Syria in response to reports that the Syrian government used chemical weapons. The new national survey by the Pew Research Center, conducted Aug. 29-Sept. 1 among 1,000 adults, finds that Obama has significant ground to make up in his own party. 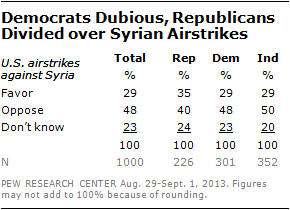 Just 29% of Democrats favor conducting airstrikes against Syria while 48% are opposed. Opinion among independents is similar (29% favor, 50% oppose). 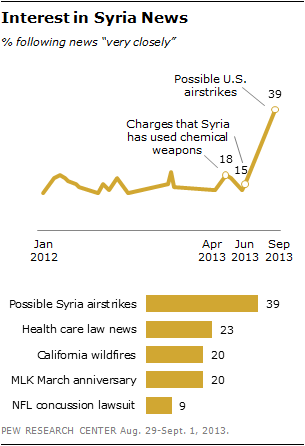 Republicans are more divided, with 35% favoring airstrikes and 40% opposed. The public has long been skeptical of U.S. involvement in Syria, but an April survey found more support than opposition to the idea of a U.S.-led military response if the use of chemical weapons was confirmed. The new survey finds both broad concern over the possible consequences of military action in Syria and little optimism it will be effective. 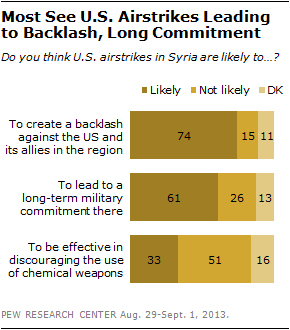 Three-quarters (74%) believe that U.S. airstrikes in Syria are likely to create a backlash against the United States and its allies in the region and 61% think it would be likely to lead to a long-term U.S. military commitment there. Meanwhile, just 33% believe airstrikes are likely to be effective in discouraging the use of chemical weapons; roughly half (51%) think they are not likely to achieve this goal. However, most believe Assad is guilty of using chemical weapons; 53% say there is clear evidence that the Syrian government used them against civilians there while just 23% say there is no clear evidence of a chemical attack. 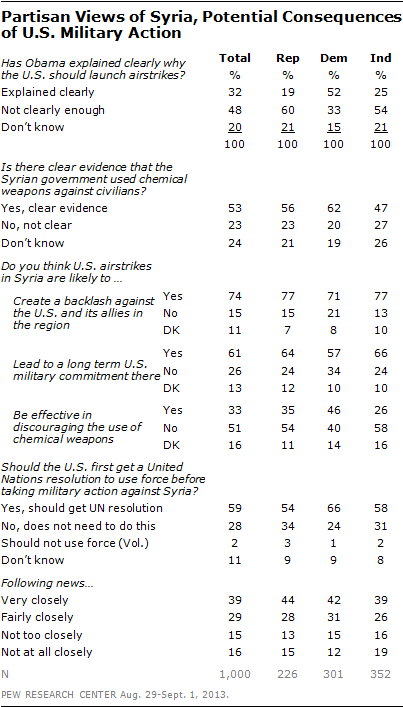 While those who think the evidence is clear offer modestly more support for airstrikes, even here as many oppose as support U.S. military involvement (41% each). Overall, just 32% of Americans say Obama has explained clearly why the U.S. should launch military airstrikes against Syria while 48% say he has not explained the reasons clearly enough. Although Democrats tend to oppose airstrikes against Syria, they give higher marks than Republicans to Obama for making the case for military action. 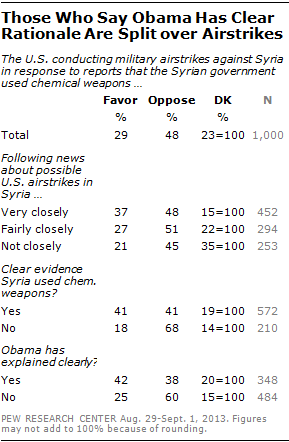 About half of Democrats (52%) say Obama has clearly explained reasons for conducting airstrikes in Syria, while 33% say he has not. Majorities of Republicans (60%) and independents (54%) say he has not explained the rationale for airstrikes clearly enough. Most independents (58%) and Republicans (54%) also say that U.S. airstrikes in Syria are not likely to be effective in discouraging the use of chemical weapons. Democrats are more closely divided – nearly as many say they will not be effective (40%) in achieving this goal as say they will (46%). There is less disagreement over other possible consequences of military action: Majorities of Republicans (77%), independents (77%) and Democrats (71%) say U.S. airstrikes are likely to create an anti-U.S. backlash in the region, while smaller majorities in all three groups also say they are likely to lead to a long U.S. commitment in Syria. proposed military action. Among women, just 19% support airstrikes, while 49% are opposed. Women are more uncertain about what to do at this point – 31% offer no opinion compared with just 15% of men. There are few other major demographic differences of opinion: for example, young and old, college graduates and those with no college offer similar levels of support and opposition. Support for military airstrikes runs somewhat higher among those who have followed the story the most closely: 37% of those who say they have tracked news about the possibility of airstrikes “very closely” favor airstrikes compared with just 21% of those who say they have followed “not too” or “not at all” closely. Yet opposition to the idea is prevalent regardless of people’s level of interest – nearly half oppose airstrikes among the most and least attentive segments of the public. Those who see clear evidence of chemical weapons use by Syria – and those who say Obama has clearly explained reasons for using military force – are divided over whether the U.S. should conduct airstrikes. Among the 53% of Americans who say there is clear evidence the Syrian government used chemical weapons against civilians, opinion is split evenly as to whether the U.S. should (41%) or should not (41%) conduct airstrikes. Among the 32% who say Obama has explained clearly why the U.S. should launch airstrikes, 42% favor doing so, while 38% remain opposed. Roughly four-in-ten (39%) followed news about potential U.S. airstrikes in Syria “very closely.” The percentage following news about Syria very closely has approximately doubled from recent weeks, when no more than about 20% tracked Syrian developments very closely, including earlier charges this year that the government used chemical weapons. Americans paid more attention to the Syrian developments than other stories this week, including news about the health care laws (23% very closely), wildfires in California (20%) and the 50th anniversary of the March on Washington (20%). About one-in-ten (9%) very closely followed the news about the NFL’s agreement with former players about concussion-related lawsuits.